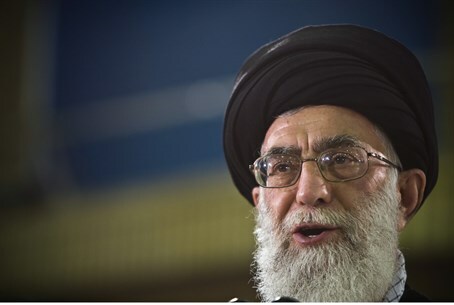 In a Twitter tirade, Iran's Supreme Leader calls for Israel's destruction, says that Palestinian Arabs should be armed. Iran’s Supreme Leader, Ayatollah Ali Khamenei, on Saturday once again called for Israel’s destruction. Khamenei’s latest provocation came in a series of tweets in which he launched a tirade against the Jewish state and called to arm Palestinian Arabs in Judea and Samaria. “This barbaric, wolflike & infanticidal regime of #Israel which spares no crime has no cure but to be annihilated,” read one tweet. “The only means to confront a barbaric regime like #Israel is arming West Bank,” read another tweet by the Supreme Leader. “We've seen 100s of times that #Israel doesn't abide by #peace.They didn't even tolerate Arafat who cooperated w/them& poisoned him to death,” charged Khamenei in another post, referring to the death of former Palestinian Authority Chairman Yasser Arafat. "#WestBank should be armed just like #Gaza. Friends of Palestine should do their best to arm People in West Bank,” another tweet read. This is certainly not the first time that Khamenei has called for Israel’s destruction. Last month, the Iranian leader accused Israel of having "no limit or boundaries regarding viciousness, cruelty, and trampling underfoot all human standards and ethnics. Crimes, genocide, mass destruction, the killing of children, women and the homeless...they take pride in." The latest Twitter rant, ironically enough, comes just days after reports indicated that U.S. President Barack Obama had written a letter to Khamenei in which he indicated that cooperation on ISIS depends on an agreement being reached by the November 24 deadline regarding Iran's nuclear program. The White House would not comment on the reports and would only reiterate that Washington’s policy toward Iran has not changed, but Obama’s national security advisor, Susan Rice, on Friday said that Washington was “not engaged with Iran” regarding ISIS.